Back in 2015, Lisa Unger Baskin placed her extensive collection of more than 11,000 books, manuscripts, photographs, and artifacts in the Sallie Bingham Center for Women’s History & Culture in the David M. Rubenstein Rare Book & Manuscript Library. 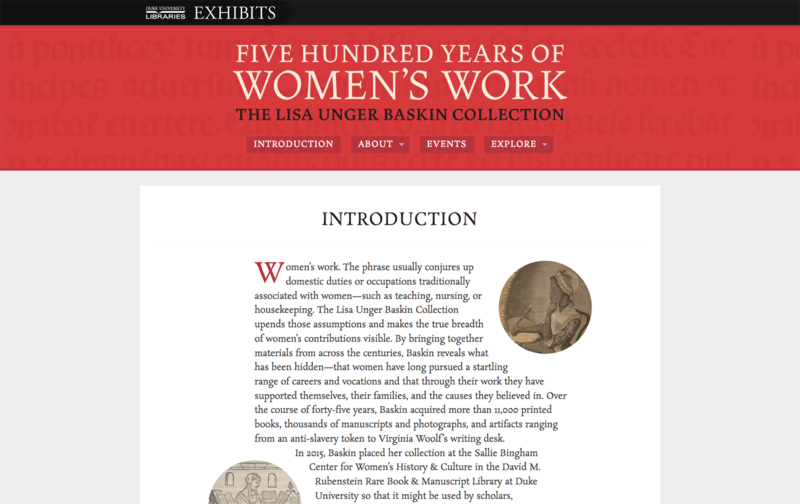 In late February of 2019, the Libraries opened the exhibit “Five Hundred Years of Women’s Work: The Lisa Unger Baskin Collection” presenting visitors with a first look at the diversity and depth of the collection, revealing the lives of women both famous and forgotten and recognizing their accomplishments. I was fortunate to work on the online component of the exhibit in which we aimed to offer an alternate way to interact with the materials. Most of the online exhibits I have worked on have not had the benefit of a long planning timeframe, which usually means we have to be somewhat conservative in our vision for the end product. However, with this high-profile exhibit, we did have the luxury of a (relatively) generous schedule and as such we were able to put a lot more thought and care into the planning phase. The goal was to present a wide range and number of items in an intuitive and user-friendly manner. We settled on the idea of arranging items by time period (items in the collection span seven centuries!) and highlighting the creators of those items. 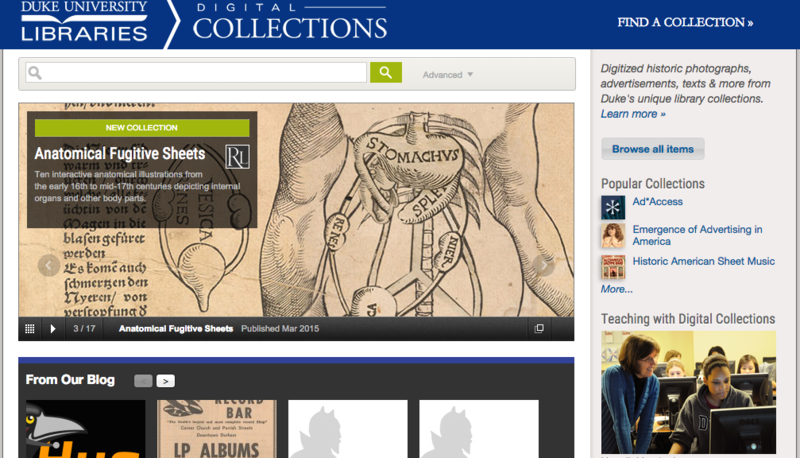 We also decided to use Omeka (classic!) for our content management system as we’ve done with most of our other online exhibits. Usually exhibit curators manually enter the item information for their exhibits, which can get somewhat tedious. In this case, we were dealing with more than 250 items, which seemed like a lot of work to enter one at a time. I was familiar with the CSV Import plugin for Omeka, which allows for batch uploading items and mapping metadata fields. It seemed like the perfect solution to our situation. My favorite feature of the plugin is that it also allows for quickly undoing an ingest in case you discover that you’ve made a mistake with mapping fields or the like, which made me less nervous about applying batch uploads to our production Omeka instance that already contained about 1,100 items. 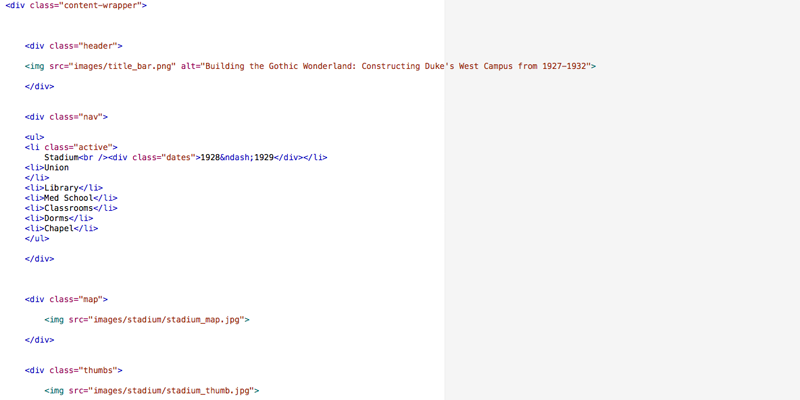 Working with the curators, we came up with a data model that would nest well within Omeka’s default Dublin-core based approach and expanded that with a few extra non-standard fields that we attached to a new custom item type. We then assembled a small sample set of data in spreadsheet form and I worked on spinning up a local instance of Omeka to test and make sure our approach was actually going to work! After some frustrating moments with MAMP and tracking down strange paths to things like imagemagick (thank you eternally, Stack Overflow!) I was able to get things running well and was convinced the batch uploads via spreadsheet was a good approach. Now that we had a process in place, I began work on a custom theme to use with the exhibit. I’d previously used Omeka Foundation (a grid-based starter theme using the Zurb Foundation CSS framework) and thought it seemed like a good place to start with this project. The curators had a good idea of the site structure that they wanted to use, so I jumped right in on creating some high-fidelity mockups borrowing look-and-feel cues from the beautiful print catalog that was produced for the exhibit. After a few iterations we arrived at a place where everyone was happy and I started to work on functionality. I also worked on incorporating a more recent version of the Foundation framework as the starter theme was out of date. The core feature of the site would be the ability to browse all of the items we wanted to feature via the Explore menu, which we broke into seven sections — primarily by time period, but also by context. After looking at some other online exhibit examples that I thought were successful, we decided to use a masonry layout approach (popularized by sites like Pinterest) to display the items. Foundation includes a great masonry plugin that was very easy to implement. Another functionality issue had to do with displaying multi-page items. Out of the box, I think Omeka doesn’t do a great job displaying items that contain multiple images. I’ve found combining them into PDFs works much better, so that’s what we did in this case. I also installed the PDF Embed plugin (based on the PDF.js engine) in order to get a consistent experience across browsers and platforms. Once we got the theme to a point that everyone was happy with it, I batch imported all of the content and proceeded with a great deal of cross-platform testing to make sure things were working as expected. We also spent some time refining the display of metadata fields and making small tweaks to the content. Overall I’m very pleased with how everything turned out. 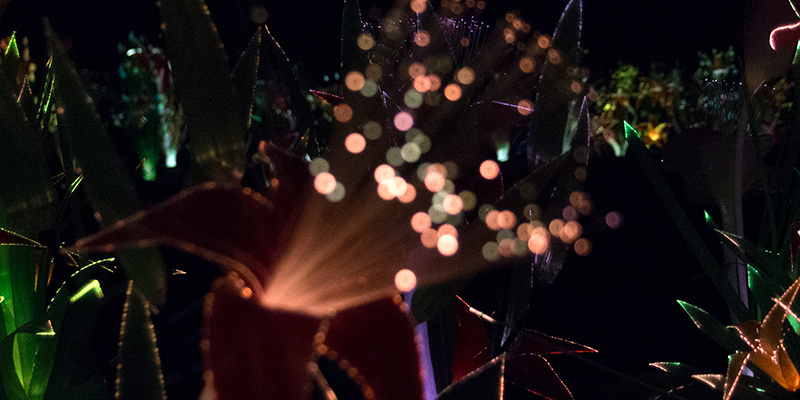 User traffic has been great so far so it’s exciting to know that so many people have been able to experience the wonderful items in the exhibit. Please check out the website and also come visit in person — on display until June 15, 2019. 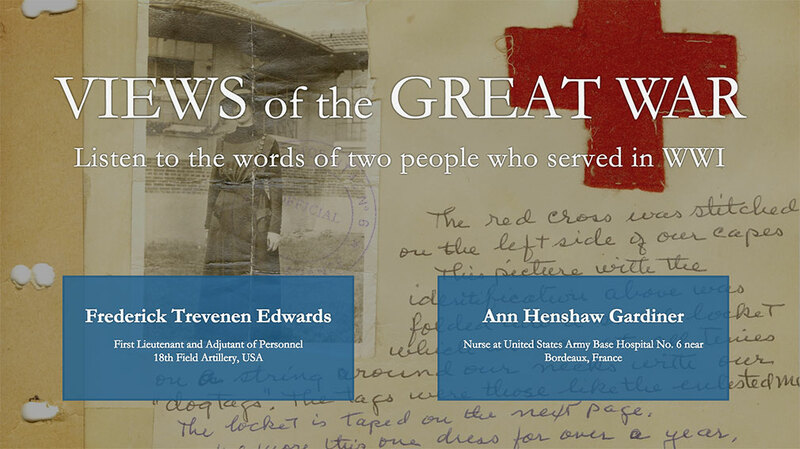 I recently worked on an interactive kiosk for a new exhibit in the library — Views of the Great War: Highlights from the Duke University Libraries. 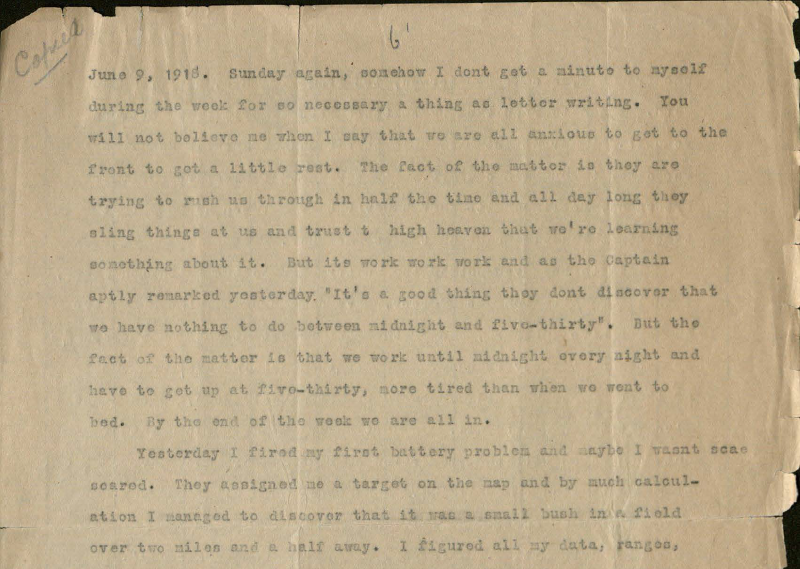 Elizabeth Dunn, the exhibit curator, wanted to highlight a series of letters that shared the experiences of two individuals during the war. She was able to recruit the talents of Jaybird O’Berski and Ahnna Beruk who brought the writings of Frederick Trevenen Edwards and Ann Henshaw Gardiner to life. Elizabeth and I booked time for Jay and Ahhna in the Multimedia Production Studio where we recorded their performances. I then edited down multiple takes into more polished versions and created files I could use with the kiosk. I also used youtube’s transcript tool to get timed captions working well and to export VTT files. 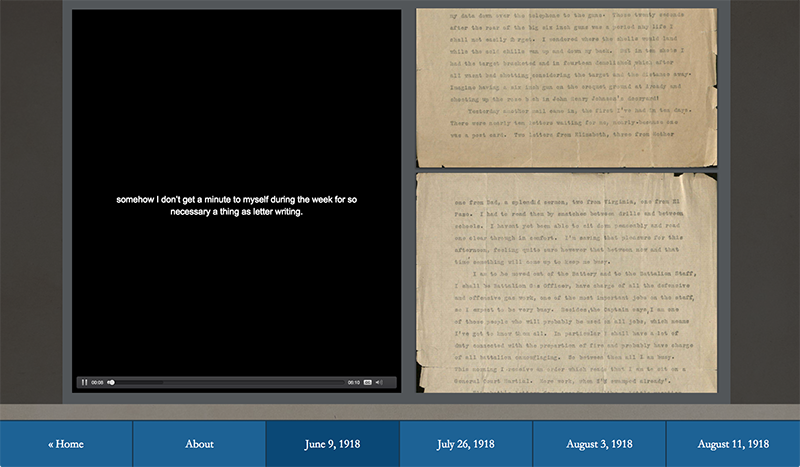 The final interface allows users to both listen to the performances and read timed transcriptions of the letters while also being able to scroll through the original typed versions. 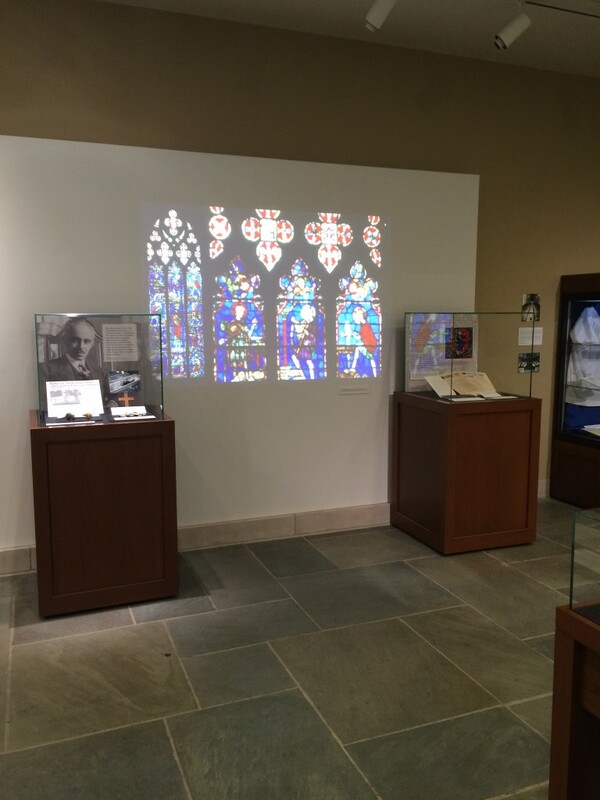 The exhibit is housed in the Mary Duke Biddle Room and runs through February 16. Come check it out! 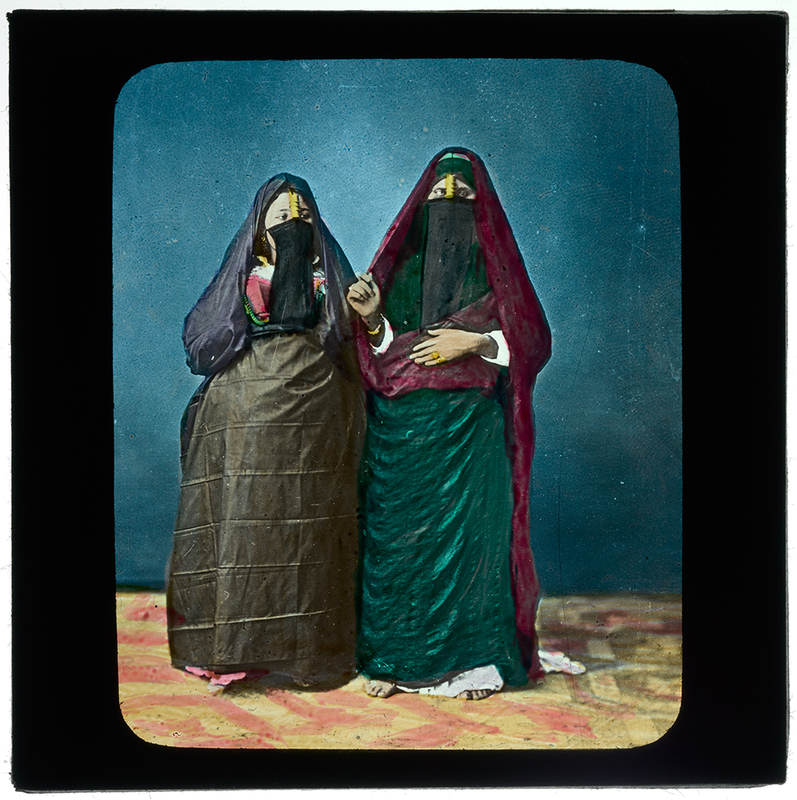 An amazing collection of lantern slides depicting women from nations around the world. At first glance, the women in these portraits seem like other portraits of the time, generally nondescript portraits of people at some random moment in time. But upon closer inspection, and with the use of an accompanying lecture booklet, a much deeper picture is painted of the lives of these women. 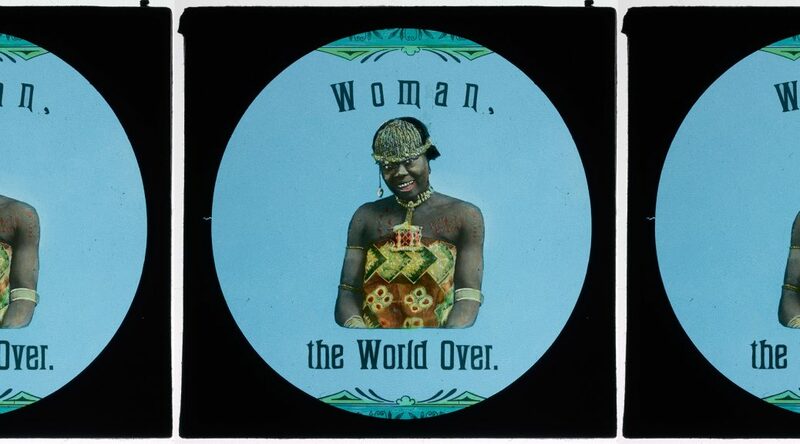 Women: The World Over is a commercially-produced set of slides created by the European firm Riley Brothers in Bradford, England in 1901 that boasts a catalogue of 1,500 slide sets for sale or hire with lecture-format captions. 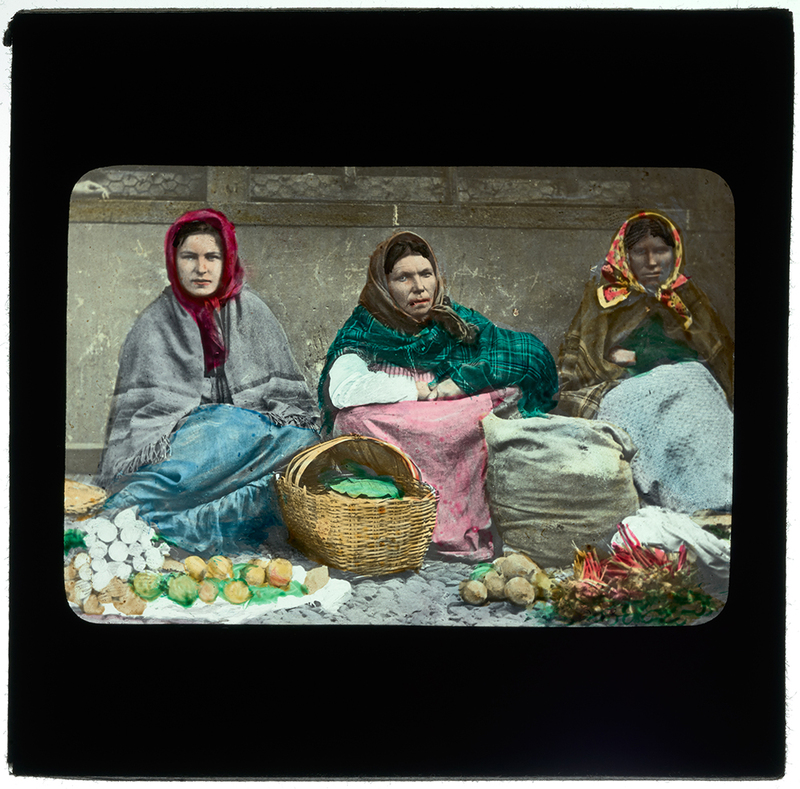 These slides include women of different classes, working in agricultural, service, and industrial settings with lecture notes that refer to problematic social conditions for women, particularly regarding marriage, and changing social norms as the 20th century begins. 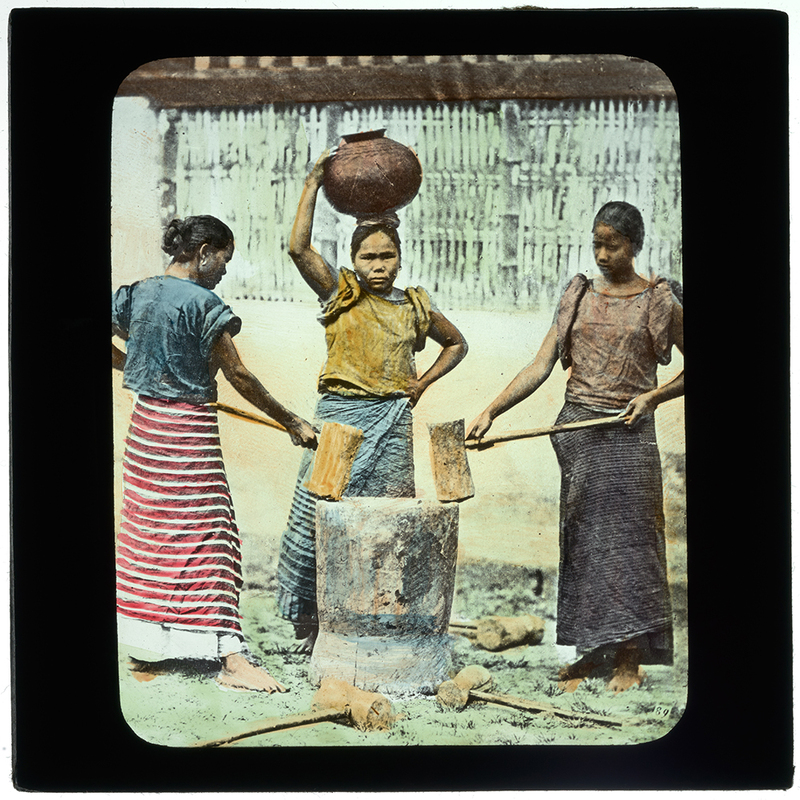 These lantern slides are part of the Lisa Unger Baskin Collection, a large collection with a common thread of revealing the often hidden role of women working and being productive throughout history. 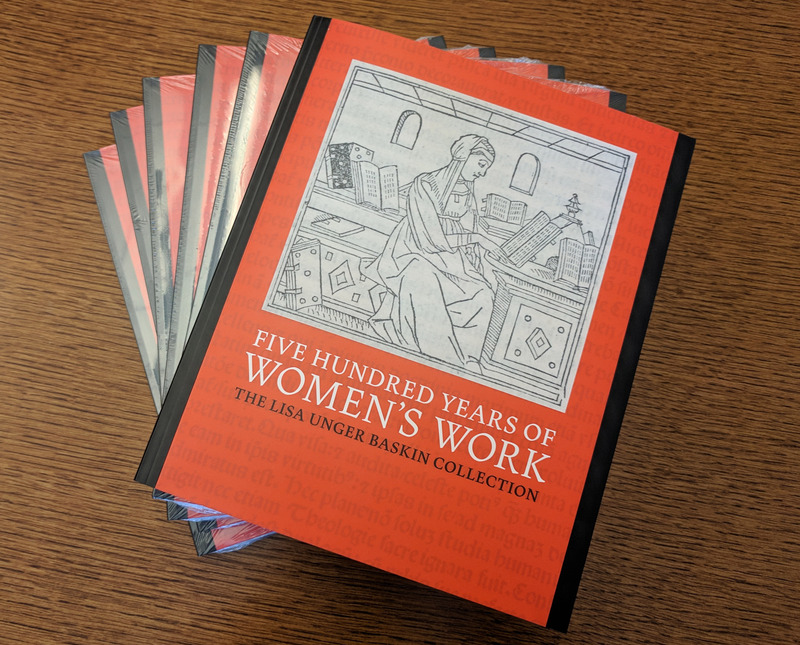 The slides will be a part of the exhibition, 500 Years of Women’s Work: the Lisa Unger Baskin Collection on display from March 5-June 15, 2019 in the Biddle Rare Book Room, Stone Family Gallery, and History of Medicine Room. 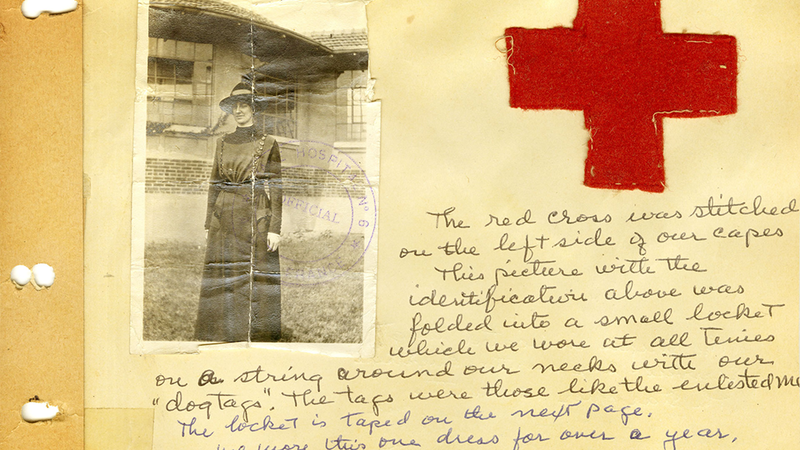 Included with the images below are transcriptions from the lecture booklet that accompanies this set of slides and contain views of the time and the author’s opinion. 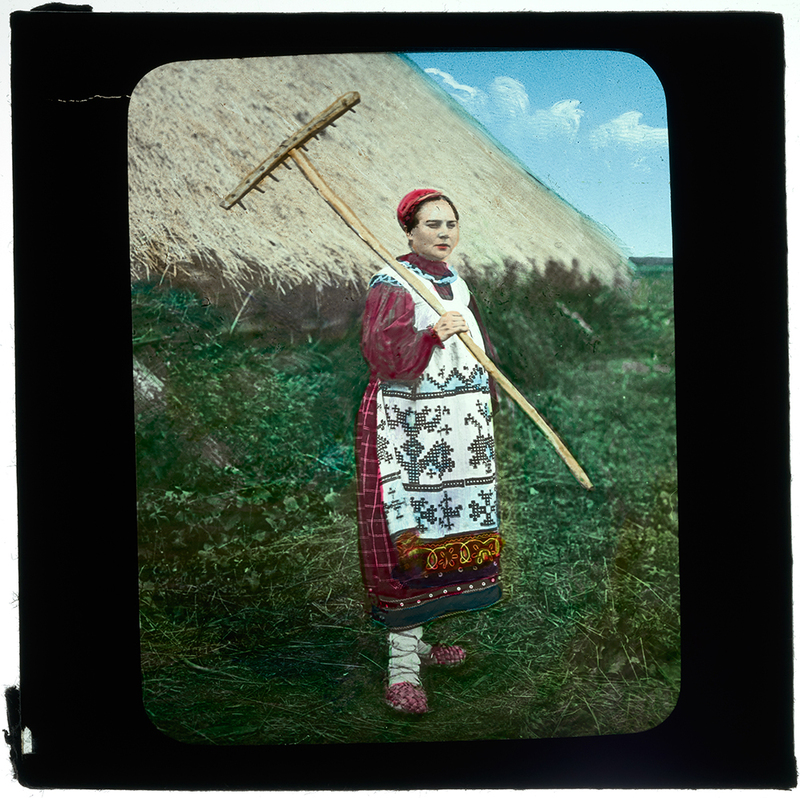 “Haymaking in Russian. Then we all know that woman from the earliest recorded times has been employed in harvest operations, and has been at home in the field of peace. This seems fitting work for women, and work which she seems always willing to undertake. 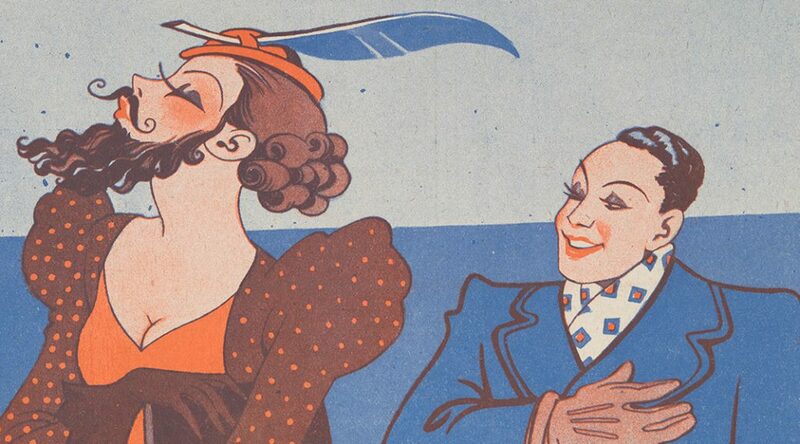 All 48 slides and the accompanying booklet will be published on the Digital Collections website later this year, included in the exhibit mentioned above and will also be traveling to the Grolier Club in New York city in December of 2019. Keep an eye out for them! Recently I worked on a simple kiosk for a new exhibit in the library, Yasak/Banned: Political Cartoons from Late Ottoman and Republican Turkey. 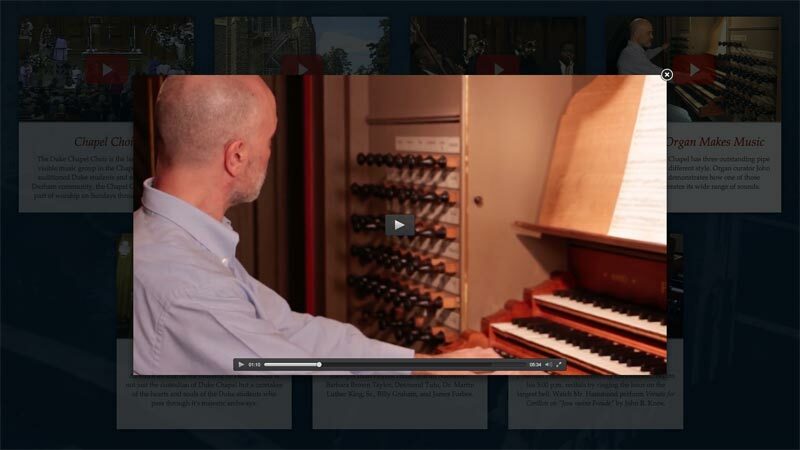 The interface presents users with three videos featuring the curators of the exhibit that explain the historical context and significance of the items in the exhibit space. We also included a looping background video that highlights many of the illustrations from the exhibit and plays examples of Turkish music to help envelop visitors into the overall experience. With some of the things I’ve built in the past, I would setup different section of an interface to view videos, but in this case I wanted to keep things as simple as possible. My plan was to open each video in an overlay using fancybox. However, I didn’t want the looping background audio to interfere with the curator videos. We also needed to include a ‘play/pause’ button to turn off the background music in case there was something going on in the exhibit space. And I wanted all these transitions to be as smooth as possible so that the experience wouldn’t be jarring. What seemed reasonably simple on the surface proved a little more difficult than I thought. After trying a few different approaches with limited success, as usual stackoverflow revealed a promising direction to go in — the key turned out to be the .animate jQuery method. The first step was to write functions to ‘play/pause’ – even though in this case we’d let the background video continue to play and only lower the volume to zero. The playVid function sets the volume to 0, then animates it back up to 100% over three seconds. pauseVid does the inverse, but more quickly. You can view a demo version and download a zip of the assets in case it’s helpful. I think the final product works really well and I’ll likely use a similar implementation in future projects. 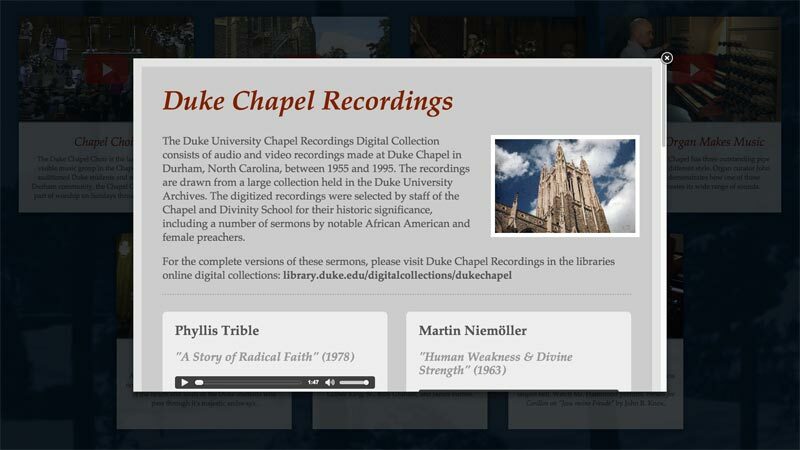 While most of my Bitstreams posts have focused on my work preserving and archiving audio collections, my job responsibilities also include digitizing materials for display in Duke University Libraries Exhibits. 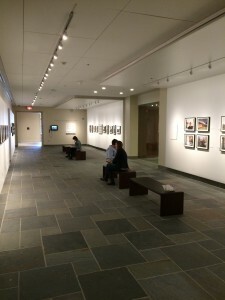 The recent renovation and expansion of the Perkins Library entrance and the Rubenstein Library have opened up significantly more gallery space, meaning more exhibits being rotated through at a faster pace. Working with such a variety of media spanning different library collections presents a number of challenges and necessitates working closely with our Exhibits and Conservation departments. First, we have to make sure that we have all of the items listed in the inventory provided by the exhibit curator. Secondly, we have to make sure we have all of the relevant information about how each item should be digitally captured (e.g. What image resolution and file specifications? Which pages from a larger volume? What section of a larger map or print?) Next we have to consider handling for items that are in fragile condition and need special attention. Finally, we use all of this information to determine which scanner, camera, or A/V deck is appropriate for each item and what the most efficient order to capture them in is. All of this planning and preliminary work helps to ensure that the digitization process goes smoothly and that most questions and irregularities have already been addressed. Even so, there are always issues that come up forcing us to improvise creative solutions. For instance: how to level and stabilize a large, fragile folded map that is tipped into a volume with tight binding? How to assemble a seamless composite image of an extremely large poster that has to be photographed in multiple sections? How to minimize glare and reflection from glossy photos that are cupped from age? 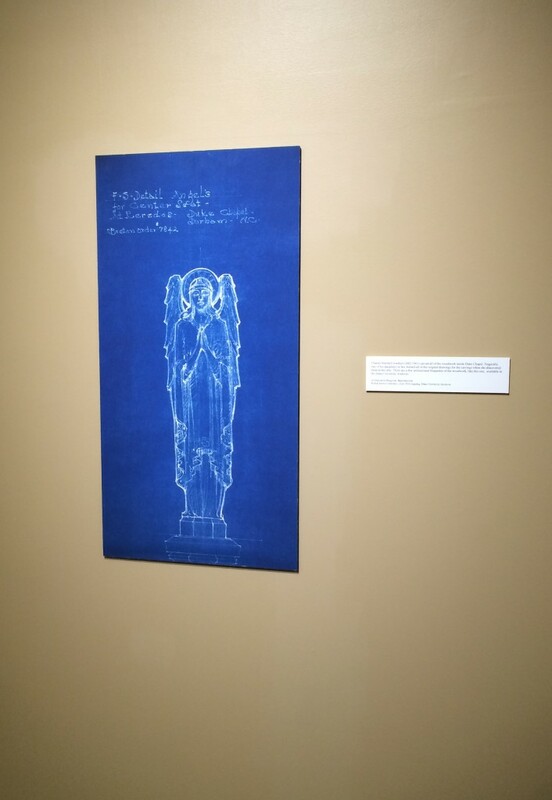 I won’t give away all of our secrets here, but I’ll provide a couple examples from the Duke Chapel exhibit that is currently on display in the Jerry and Bruce Chappell Family gallery. 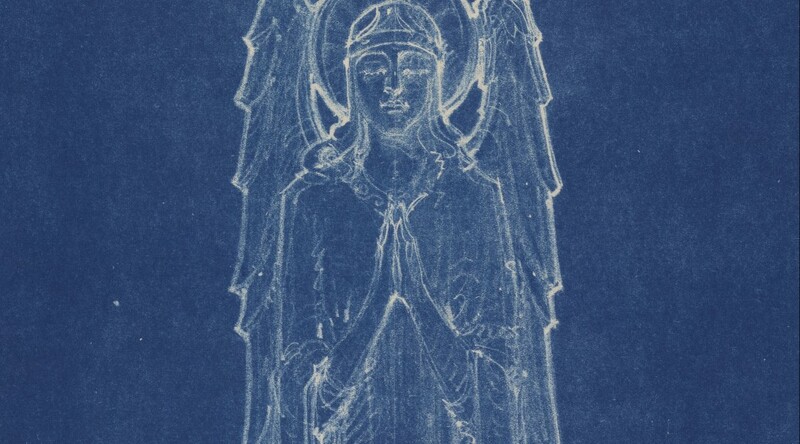 This facsimile of a drawing for one of the Chapel’s carved angels was reproduced from an original architectural blueprint. It came to us as a large and tightly rolled blueprint–so large, in fact, that we had to add a piece of plywood to our usual camera work surface to accommodate it. We then strategically placed weights around the blueprint to keep it flattened while not obscuring the section with the drawing. The paper was still slightly wrinkled and buckled in places (which can lead to uneven color and lighting in the resulting digital image) but fortunately the already mottled complexion of the blueprint material made it impossible to notice these imperfections. 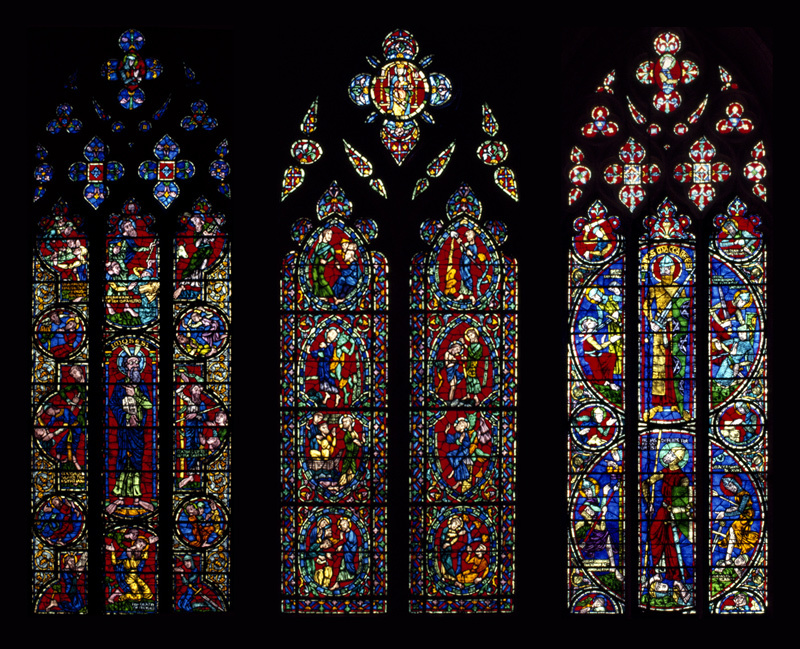 These projected images of the Chapel’s stained glass were reproduced from slides taken by a student in 1983 and currently housed in the University Archives. After the first run through our slide scanner, the digital images looked okay on screen, but were noticeably blurry when enlarged. Further investigation of the slides revealed an additional clear plastic protective housing which we were able to carefully remove. 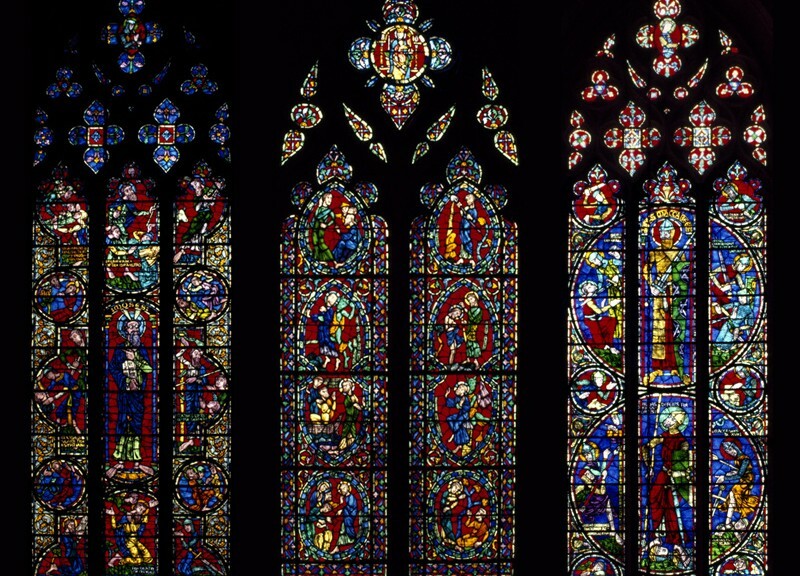 Without this extra refractive layer, the digital images were noticeably sharper and more vibrant. Despite the digitization challenges, it is satisfying to see these otherwise hidden treasures being displayed and enjoyed in places that students, staff, and visitors pass through everyday–and knowing that we played a small part in contributing to the finished product! 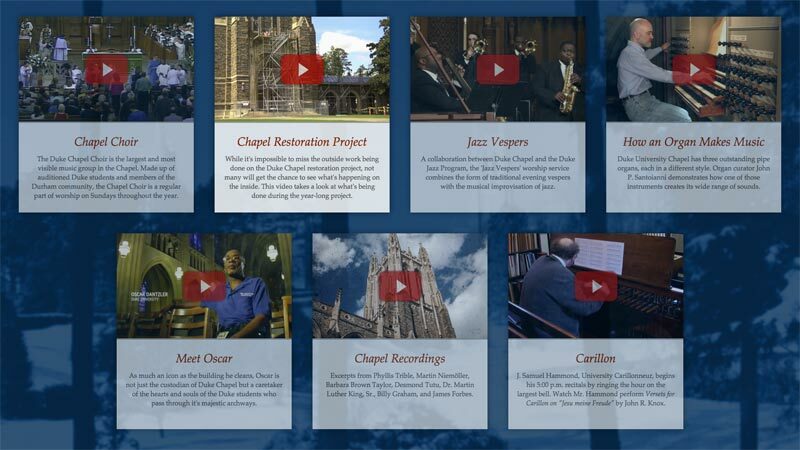 Over the past few weeks I’ve been working on content for a new exhibit in the library; An Iconic Identity: Stories and Voices of Duke University Chapel. I’d like to share what we created and how they were built. 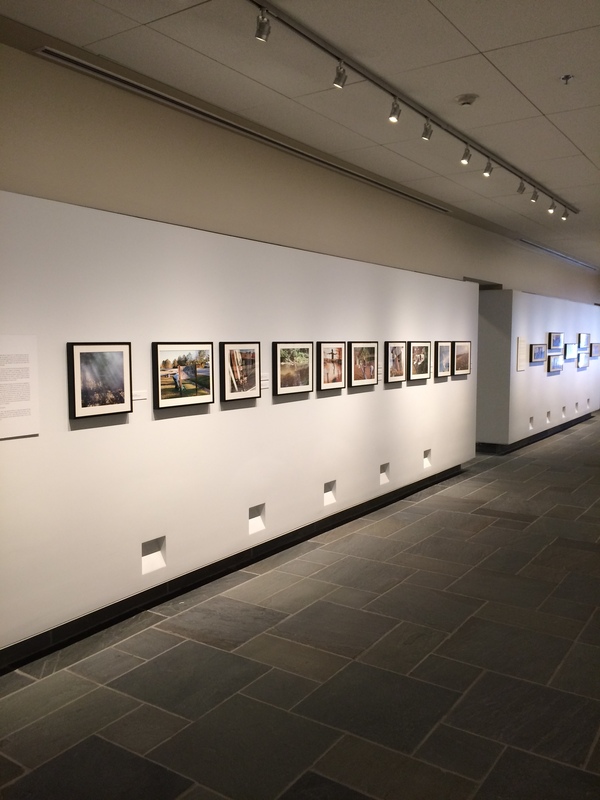 The exhibit will be on display until June 19 – please swing by and check it out! We experience a number of different cycles in the Digital Projects and Production Services Department (DPPS). There is of course the project lifecycle, that mysterious abstraction by which we try to find commonalities in work processes that can seem unique for every case. We follow the academic calendar, learn our fate through the annual budget cycle, and attend weekly, monthly, and quarterly meetings. The annual reporting cycle at Duke University Libraries usually falls to departments in August, with those reports informing a master library report completed later. Because of the activities and commitments around the opening of the Rubenstein Library, the departments were let off the hook for their individual reports this year. Nevertheless, I thought I would use my turn in the Bitstreams rotation to review some highlights from our 2014-15 cycle. bentodukechapeldukechroniclegedneyhleewatersrubenstein_barnardgardnerrubenstein_fugitivesheetsSNCC Legacy ProjectW. Duke Sons & Co.
On a somewhat related note, I recently traveled to Italy and was able to spend an afternoon at the Venice Biennale, which is an international contemporary art show that takes place every other year. Participating artists install their work across nearly 90 pavilions and there’s also a central gallery space for countries that don’t have their own buildings. It’s really an impressive amount of work to wander through in a single day and I wasn’t able to see everything, but many of the works I did see was amazing. Three exhibits in particular were striking to me. 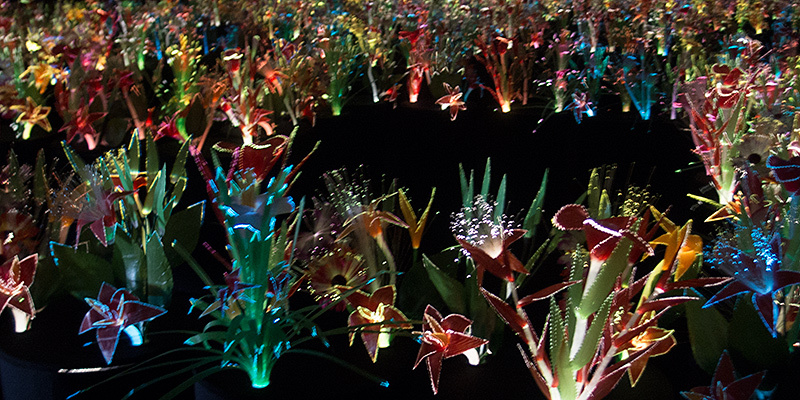 The first I’ll highlight is the work of Joana Vasconcelos, titled Il Giardino dell’Eden, which was housed in a silver tent of a building from one of the event sponsors, Swatch (the watch company). As I entered I was immediately met with a dark and cool space, which was fantastic on this particularly hot and humid day. 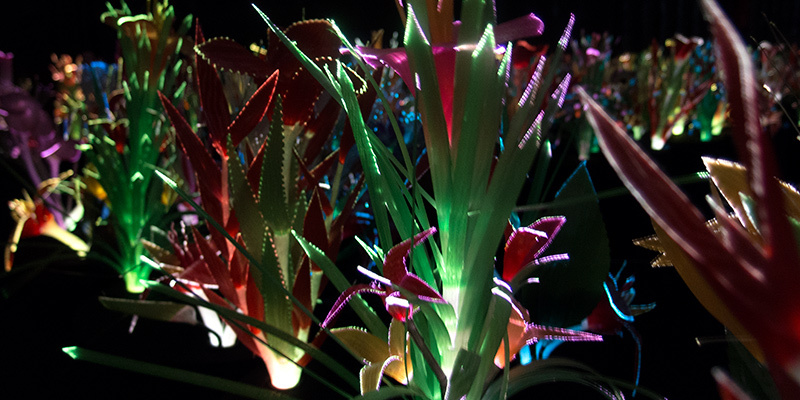 The room was filled with an installation of glowing fiber optic flowers that pulsated with different patterns of color. It was beautiful and super engaging. I spent a long time wandering through the pathway trying to take it all in. 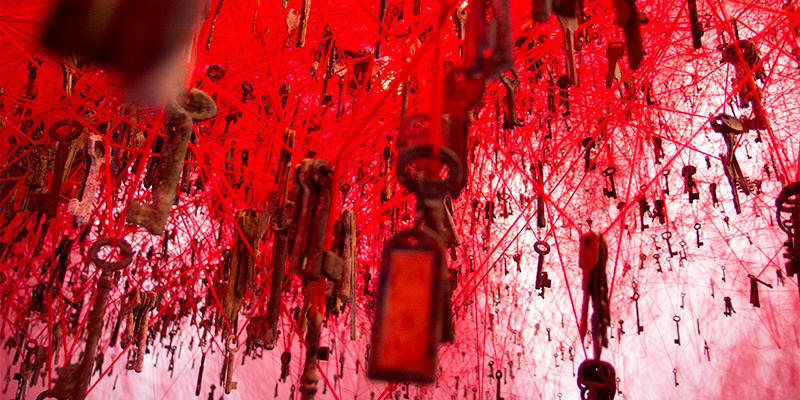 Another engrossing installation was housed in the French Pavilion; Revolutions by Celeste Boursier-Mougenot. I walked into a large white room where a tree with a large exposed rootball was sitting off to the side. There were deep meditative tones being projected from somewhere close by. I noticed people were lounging in the wings of the space, so I wandered over to check it out for myself. What looked like a wooden bleacher of sorts actually turned out to be made of some sort of painted foam. So as I stumbled and laughed when I tried to first walk on it, like many others who came into the space later, I plopped down to soak in the exhibit. I noticed the deep tones were subtly rhythmic and they definitely gave off a meditative vibe, so it was nice to relax a bit after a long day of walking. But then I noticed the large tree was not where it had been when I first entered the room. It was moving, but very slowly. Utterly interesting. It almost seemed to levitate. I’d really like to know how it worked (there were also two more trees outside the pavilion that moved in the same way). Overall it was a fantastic experience. 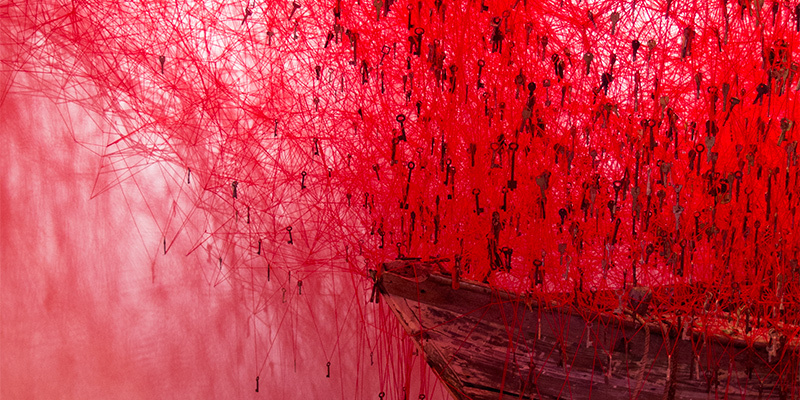 My favorite installation was in the Japanese Pavilion; The Key in the Hand by Chiharu Shiota. 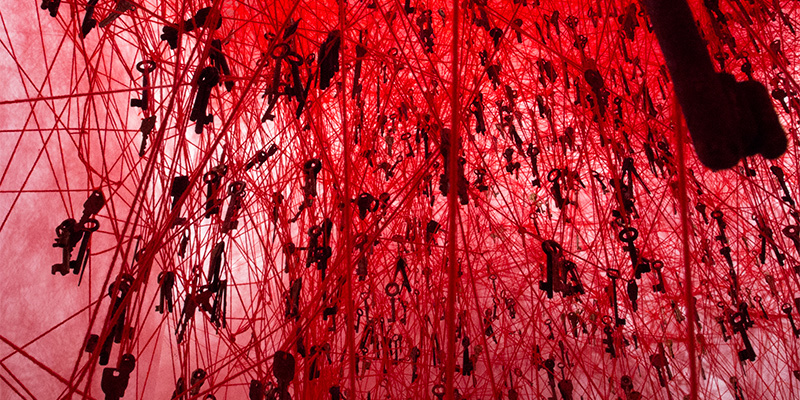 The space was filled with an almost incomprehensible number of keys dangling from entangled red yarn suspended from the ceiling of the room. There were also a few small boats positioned around the space. My first instinct was that I was standing underneath a red sea. It’s really hard to describe just how much ‘red’ there actually is in the space. The intricacy of the threads and the uniqueness of almost every key I looked at was simply mind blowing. I think my favorite part of the exhibit was nestled in a corner of the room where an iPad sat looping a time compressed video of the installation of the work. It was uniquely satisfying to watch it play out and come together over and over. I’m not sure how to tap into that experience for exhibits in the library, but it’s something we can certainly aim for! Back in October, Molly detailed DigEx’s work on creating an exhibit for the Link Media Wall. We’ve finally finalized our content and hope to have the new exhibit published to the large display in the next week or two. I’d like to detail how this thing is actually put together. I broke the content chunks into five main sections: the masthead (which holds the branding), the navigation (which highlights the current section and construction period), the map (which shows the location of the buildings), the thumbnail (which shows the completed building and adds some descriptive text), and the images (which houses a set of cross-fading historic photos illustrating the progression of construction). Working with a fixed-pixel layout feels strange in the modern world of web development, but it’s quick and satisfying to crank out. I’m using the jQuery Cycle plugin to transition the images, which is lightweight and offers lots of configurable options. I also created a transparent PNG file containing a gradient that fades to the background color which overlays the rotating images. Another part of the puzzle I wrestled with was how to transition from one section of the exhibit to another. I thought about housing all of the content on a single page and using some JS to move from one to the next, but I was a little worried about performance so I again opted for the super simple solution. Each page has a meta refresh in the header set to the number of seconds that it takes to cycle through the corresponding set of images and with a destination of the next section of the exhibit. It’s a little clunky in execution and I would probably try something more elegant next time, but it’s solid and it works. Here’s a preview of the exhibit cycling through all of the content. 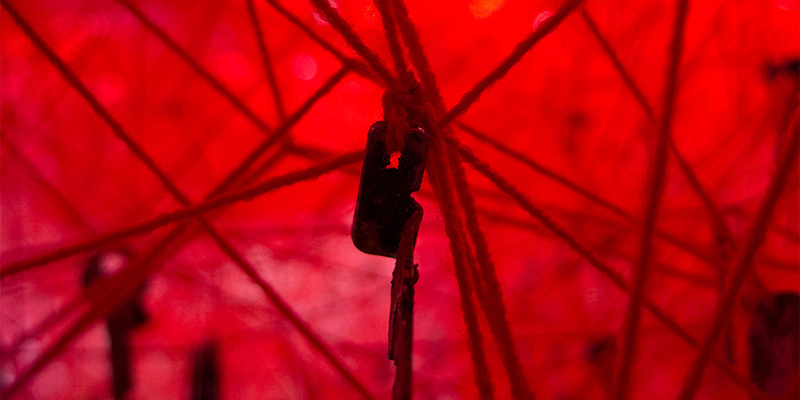 It’s been time compressed – the actual exhibit will take about ten minutes to play through. In a lot of ways this exhibit is an experiment in both process and form, and I’m looking forward to seeing how our vision translates to the Media Wall space. Using such simple code means that if there are any problems, we can quickly make changes. 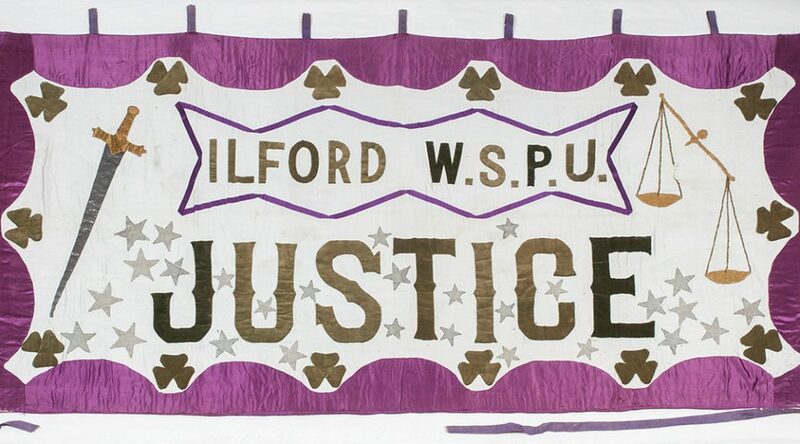 I’m also looking forward to working on future exhibits and helping to highlight the amazing items in our collections. 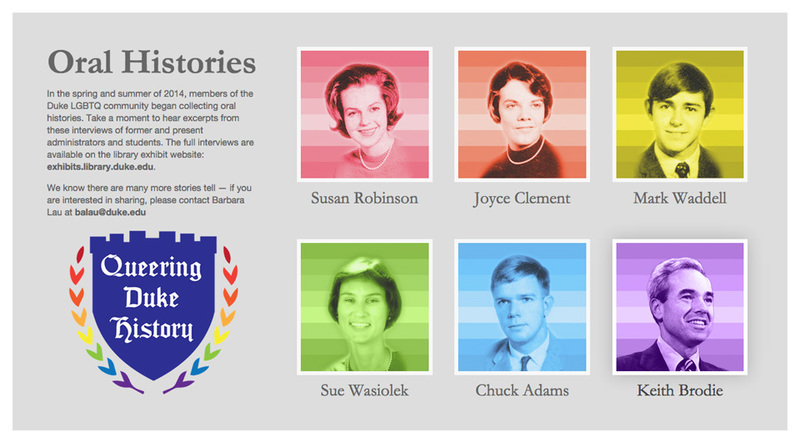 A screen from the Queering Duke History exhibit kiosk, just one of the ways DigEx supports library exhibits. 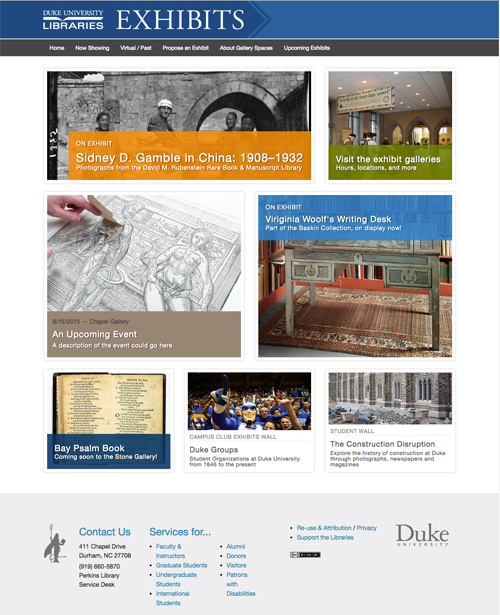 Just under a year ago Duke University Libraries formed the Digital Exhibits Working Group (DigEx) to provide vision, consulting expertise, and hands-on support to the wide array of projects and initiatives related to gallery exhibits, web exhibits, data visualizations, digital collections, and digital signage. Membership in the group is as cross-departmental as the projects they support. With representatives from Data and Visualization, Digital Projects and Production Services, Digital Scholarship Services, Communications, Exhibits, Core Services and the Rubenstein Library, every meeting is a vibrant mix of people, ideas and agenda items. 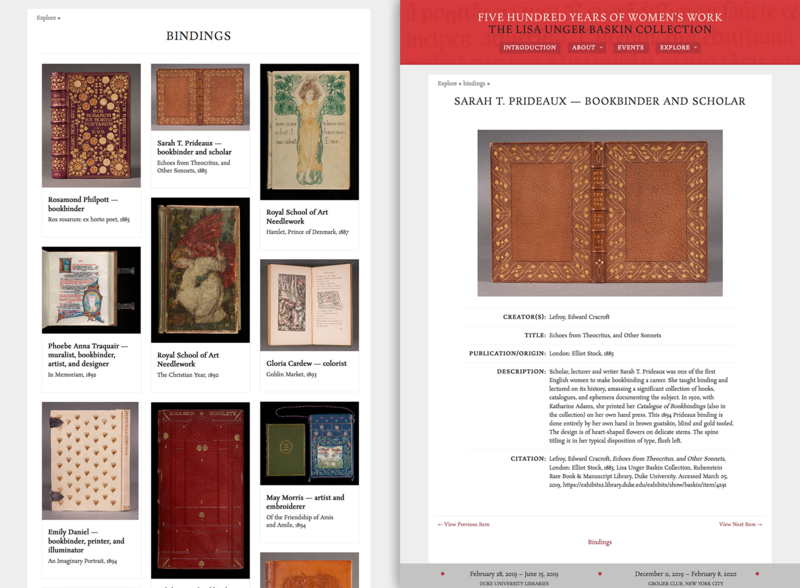 The group has taken on a number of ambitious projects; one of which is to identify and understand digital exhibits publishing platforms in the library (we are talking about screens here). 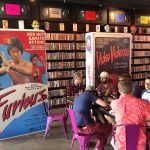 Since April, a sub-committee – or “super committee” as we like to call ourselves – of DigEx members have been meeting to curate a digital exhibit for the Link Media Wall. DigEx members have anecdotal evidence that our colleagues want to program content for the wall, but have not been able to successfully do so in the past. DigEx super committee to the rescue! The Link super committee started meeting in April, and at first we thought our goals were simple and clear. In curating an exhibit for the link wall we wanted to create a process and template for other colleagues to follow. 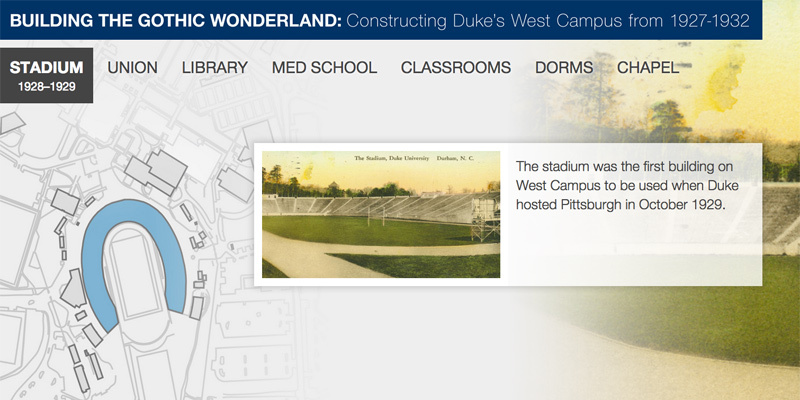 We quickly chose an exhibit topic: the construction of West Campus in 1927-1932 told through the University Archive’s construction photography digital collection and Flickr feed. 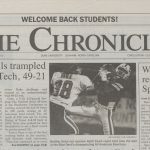 The topic is both relevant given all the West campus construction happening currently, and would allow us to tell a visually compelling story with both digitized historic photographs and opportunities for visualizations (maps, timelines, etc). 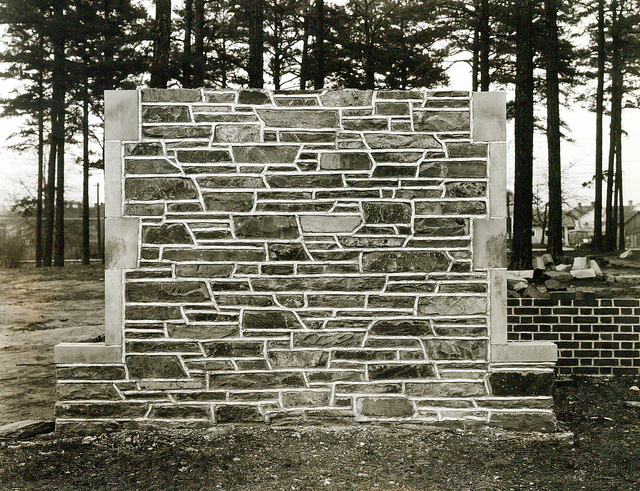 Test stone wall created by University to select the stones for our Gothic campus (1925). Our first challenge arose with the idea of templating. Talking through ideas and our own experiences, we realized that creating a design template would hinder creative efforts and could potentially lead to an unattractive visual experience for our patrons. Think Microsoft PowerPoint templates; do you really want to see something like that spread across 18 digital panels? So even though we had hoped that our exhibit could scale to other curators, we let go of the idea of a template. We had logistical challenges too. How do we design for such a large display like the media wall? How do you create an exhibit that is eye catching enough to catch attention, simple enough for someone to understand as they are walking by yet moves through content slowly enough that someone could stop and really study the images? 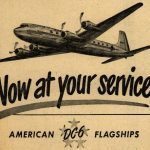 How do we account for the lines between each separate display and avoid breaking up text or images? How do we effectively layout our content on our 13-15” laptops when the final project is going to be 9 FEET long?!! You can imagine that our process became de-railed at times. 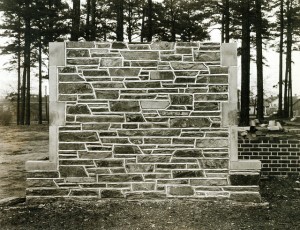 Stone was carried from the quarry in Hillsborough to campus by way of a special railroad track. But we didn’t earn the name super committee for nothing. The Link media wall coordinator met with us early on to help solve some of our challenges. Meeting with him and bringing in our DigEx developer representative really jumpstarted the content creation process. Using a scaled down grid version of the media wall, we started creating simple story boards in Powerpoint. We worked together to pick a consistent layout each team member would follow, and then we divided the work of finding images, and creating visualizations. Our layout includes the exhibit title, a map and a caption on every screen to ground the viewer in what they are seeing no matter where they come into the slideshow. We also came up with guidelines as to how quickly the images would change. Mockup of DigEx Link Media Wall exhibit showing gridlines representing delineations between each display. At this point, we have handed our storyboards to our digital projects developer and he is creating the final exhibit using HTML and web socket technology to make it interactive (see design mockup above). We are also finishing up an intro slide for the exhibit. Once the exhibit is finished, we will review our process and put together guidelines for other colleagues in DUL to follow. In this way we hope to meet our goal of making visual technology in the library more available to our innovative staff and exhibits program. 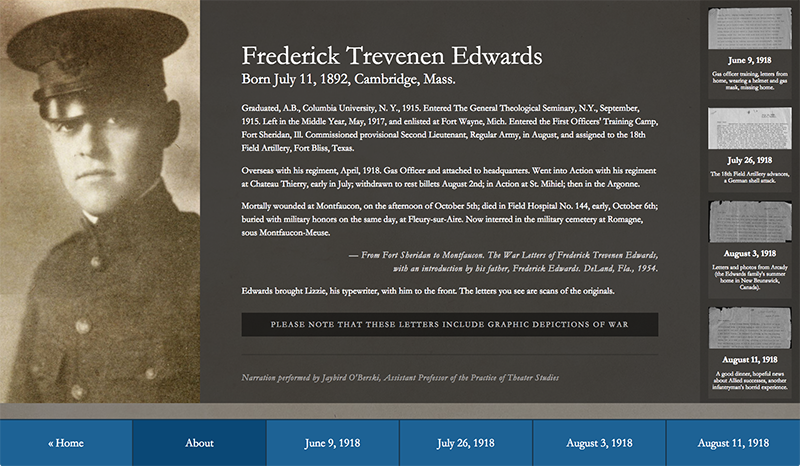 We hope to premiere the digital exhibit on the Link Wall before the end of the calendar year. Stay Tuned!! Special shout out to the Link Media Wall Exhibit Super Committee within the Digital Experiences Working Group (DigEx): Angela Zoss, Data Visualization Coordinator, Meg Brown, The E. Rhodes and Leona B. Carpenter Foundation Exhibits Coordinator, Michael Daul, Digital Projects Developer, Molly Bragg, Digital Collections Program Manager and Valerie Gillispie, University Archivist.